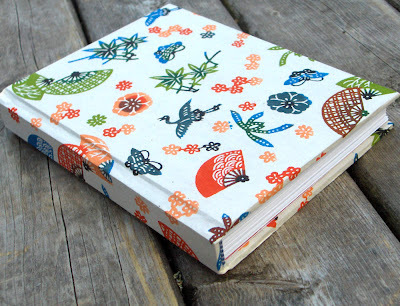 Maiko, the sprite behind Flurrsprite, sent this hardcover journal for our book swap. 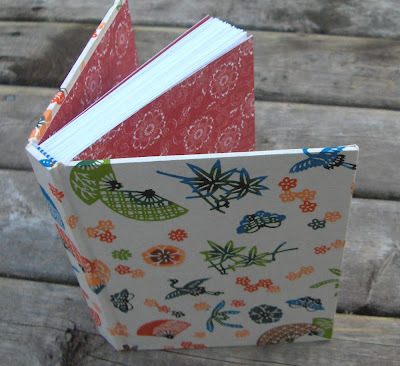 This is a case bound journal with Japanese paper on the covers. It came with a little note: My name is The Fujiko Book, named after my creator's grandmother. I was made using pretty paper purchased while my creator was visiting her family in Japan. This book should give you a little taste of Japan too! Maiko's work can be see at Flurrsprite.Etsy.com. I am the lucky recipient of this book. Thank you so much Maiko - it's gorgeous! The cover paper is so vibrant. I love it. It's put together so well. Thanks for sharing your work. Gorgeous Japanese paper! What a beautiful hardcover book--well done Maiko! Really gorgeous! How did I drop the ball and miss out on this swap? I'm definitely back in on the next one. Such beautiful paper and book! Congratulations to Gretchen for 'winning' this piece. This is such a pretty little book. Lucky Gretchen!